Writer: consumer magazines, national newspapers, trade & professional; author; lecturer; editor: magazines; photo collection; website contributor. Specialities: professional horticulture; herbs, vegetables, kitchen gardens, gardeners, gardens, plants, gardens in Spain and Portugal, coastal and container gardens. Editor of 'The Horticulturist' (Chartered Institute of Horticulture) and Editor (2008-2018) of 'Herbs' (The Herb Society). Member of RHS Herb Advisory Group. Member of Suffolk NGS County Team. 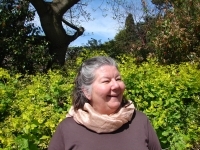 Contributor to several publications and author of several books, most recent being The Secret Gardens of East Anglia (Frances Lincoln, 2017). GWG Chairman 1997-2000. Past Editor of GMG News. Additional interests: garden books, garden tourism, walking.